At the April Technology Salon San Francisco, the discussion moderator, Aaron Mason, welcomed everyone and quickly focused the thought leaders from across the technology and development fields on the issue at hand: How Can New Technologies Improve Disaster Response? 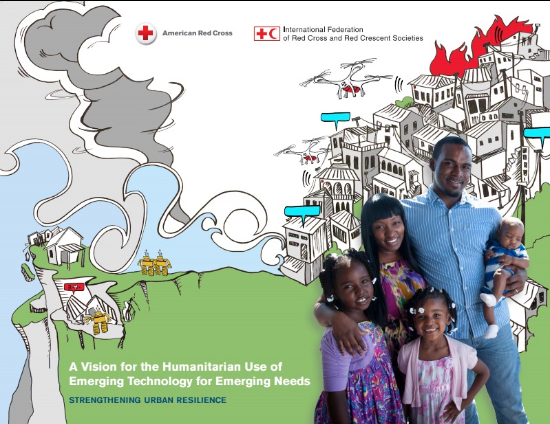 At the heart of the initial conversation was the recent American Red Cross report: A Vision for the Humanitarian Use of Emerging Technology for Emerging Needs. The report describes how new technologies like UAVs, biometrics, wearable technology, and home sensors are being deployed today, and how they may work together in the future. For example, after disasters hit, people will often only have the clothes on their back – if even that. Wearable tech can help locate survivors, biometric technology can identify people and help loved ones reconnect as soon as possible, and sensors can help firefighters contain small fires faster and notify neighbors quickly. These few steps are huge and could save precious time throughout the rescue process. Although emerging technology is exciting, in the news, and important to have, an intelligent counterpoint was brought up: “Any technology that’s used just at the disaster will fail”. I couldn’t agree more with this statement. I believe that not only do locals need to understand how ICT equipment is used and what it is used for, but the technology used in disaster management needs to provide long-term solutions, too. In the best-case scenario, the technology applied will be dual use – readily available and in use before the disaster, so there’s no learning curve when using them during and after a disaster. Tools like UAVs used for photography can quickly be re-deployed in search and rescue with minimal training. The conversation later turned to data and how humanitarian organizations report different numbers when calculating a total number of the hurt, deceased, or more. These differentials can confuse donors and governmental figures in charge of relief programs, and they could unfortunately incorrectly allocate resources needed most after disasters hit. In the case of the Ebola crisis, responders found that the number of disaster management tools reported to be in use on the ground was more than an order of magnitude higher than the number of tools actually deployed. A better system needs to be in place, and emerging technologies should certainly help with that. The part of the conversation that resonated with me the most was that communication between humanitarian groups is currently poor, but innovative technology can bridge these gaps tenfold. For example, humanitarian organizations should use a common biometric system or share unmanned aerial vehicles (UAVs) to work together, share data, restore cell service, and fly in medicine to unreachable areas. It’s an exciting time to see how technology is transforming disaster management, and I think we’re only scratching the surface of what’s to come. Jana Melpolder is Inveneo’s Media Manager and is passionate about bringing human rights issues to the forefront through ICT in the developing world.